Now more than ever is the best time to get yourself an amazing elliptical that provides you with a great sustainable workout that gives near instant and satisfying results. Yes, most times, the better the machine, the more expensive it is. 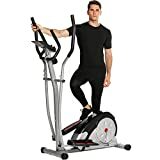 However, the Ancheer Elliptical Machine Trainer is one of those exceptions and will provide you with every feature and gadget you need to make sure you have a fantastic workout. The Ancheer Elliptical Machine Trainer aims to make your workouts easier and less inconvenient. It was created back in 2018 and has not undergone any alterations or upgrades at this time. With this elliptical, you will be capable of working out in the comfort of your home, at any time without the fear of waking anyone due to its noise reduction. It is also small and light enough to easily move it out of the way when not in use, making it greatly beneficial for smaller living spaces. Who Is the Ancheer Elliptical Machine Trainer For? The Ancheer Elliptical Machine Trainer was designed with apartments and small homes in mind as it has a smaller profile to accommodate for the space that is often found within these types of areas. It is ideal for most people but has a recommended weight limit of 250 pounds, so it is not recommended for those who are still in the process of reaching lower weight limits. Also, the Ancheer Elliptical Machine Trainer was made with the thrifty in mind as you can easily buy it at a low price. Another great quality to note is that this elliptical is beginner-friendly and comes with easy-to-follow instructions for all of its uses and functions. What’s Included with the Ancheer Elliptical Machine Trainer? When you receive your Ancheer Elliptical Machine Trainer, you will need to have it set up. Installation could take anywhere from 30 minutes to two hours depending on the one installing it. Within the box, you should expect to see all of the parts of the Ancheer Elliptical Machine Trainer, bolts, and other parts, as well as a wrench and grease that are intended to help with the assembly. There is also an accessory that is perfect for holding a tablet or smartphone. Although the wrench and grease are part of the kit, there are a few other tools that are needed that you will need to make sure you have on hand. These tools include a rubber hammer, screwdriver, and adjustable wrench. It’s also important to note that there isn’t any form of water bottle holder, so it is recommended to purchase one to install. Luckily, there are plenty of options online or in stores that will easily fit on the Ancheer Elliptical Machine Trainer. Once assembled, the Ancheer Elliptical Machine Trainer’s dimensions are 23.2 inches long, 11.6 inches wide, and 41.73 inches tall, and it would weigh roughly 79 pounds. It comes with two separate sets of handlebars, one that is stationary and has a pulse sensor, and the other that is mobile and moves with your feet. Both sets of handlebars are made of soft rubbery foam that gives it a comfortable grip. The pedals are large and wide, allowing for most foot sizes, and have a no-slip grip on the top of it. The wheel is 12 pounds and has an exceptionally quite belt system which uses a heavy-duty V-belt, ensuring that you won’t wake anyone, or you or your housemates could easily watch TV while you’re working out. It also comes with a resistance adjustment feature that has eight different levels and is very easy to change between them during the workout. The console of the Ancheer Elliptical Machine Trainer is a bit bulky and basic but provides more than enough functionality for its user. The LCD screen that tracks your time, distance, burned calories, pulse, and speed also has a SCAN function. Lastly, the elliptical comes with a set of wheels in the front that is smooth and makes it very easy for just about anyone to move it around and out of the way. When your Ancheer Elliptical Machine Trainer finally arrives, it is important to follow its instructions to ensure you get the most out of it. The instruction manual is easy to understand and is very detailed with its pictures to ensure that the machine is installed correctly. This elliptical is smooth and small. The arms are there to help support and get you moving on harder tensions. It is recommended that you put the same amount of effort in both arms and legs to ensure the longevity of this and other ellipticals. Lastly, if you wish to see how the Ancheer Elliptical Machine Trainer moves and the flow of a person using it, then you can click here to watch as someone uses the elliptical. Just like any other workout machine out there, the Ancheer Elliptical Machine Trainer has its drawbacks. Its LCD monitor does not have a backlight, making it difficult to see if too much light is on the screen. Likewise, the elliptical doesn’t come with any preset workout programs as it is completely manual. You also have the issue of the monitor being blocked if you have a tablet or phone and as stated earlier, there is no water bottle holder. There’s also the drawback of there not being any form of wireless connectivity. If any of these are deal breakers, then another option may be what’s best for you. For improved backlight, programmed workouts, an integrated water bottle holder, and wireless connection the Exerpeutic Gold 2000XLST Elliptical Trainer is a great alternative. The Ancheer Elliptical Machine Trainer is an excellent product with amazing features that can boast a decent price for the qualities provided. It’s sturdy, well made, and meets the basic needs of everyone, especially those who have limited living space. The pros greatly outweigh any of its cons as none of what is lacking is actually needed to have a fantastic and effective workout.